Nowadays, there are more diets and nutritional lifestyle variations than ever before. One of the new and more popular options is called the DASH diet. To learn more about the DASH diet and how it benefits the elderly, providers of stroke care in Altamonte Springs have put together the following information. DASH is an acronym for Dietary Approaches to Stop Hypertension and is designed to prevent or reduce hypertension (high blood pressure). To adopt a DASH diet, you would eat foods that are low in sodium but high in calcium, potassium, and magnesium. DASH has proven to be highly effective, allowing individuals to lower their blood pressure by multiple points in just a few weeks. This type of reduction is an excellent safeguard against health conditions like heart attack or stroke and can make ease the effects of existing conditions. The DASH diet has also been shown to be beneficial in maintaining the health of those with cancer, diabetes, and osteoporosis. 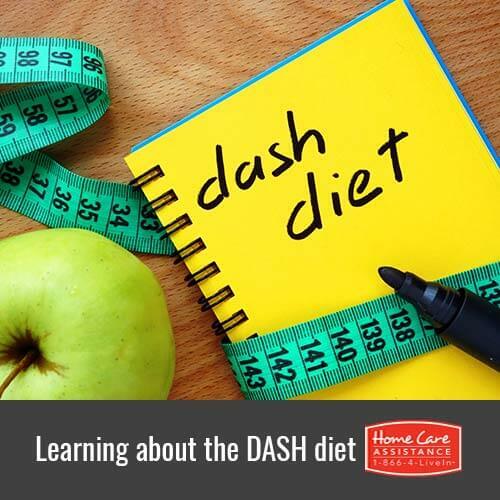 Altamonte Springs home care providers and caregivers may be surprised to learn that almost anyone can benefit from a DASH diet. The DASH diet is ideal for anyone who wants to lower blood pressure or for someone who wants to prevent high blood pressure from becoming a problem in the first place. Since sodium leads to water retention, DASH is also a good option for people who struggle with retaining water and for people who may be carrying around unwanted pounds. Since seniors are often experience problems with hypertension, heart problems, or excess weight, they are ideal candidates for the DASH diet. The DASH diet focuses on healthy food choices, which is especially important given that seniors need essential nutrients to help their bodies function more efficiently and maintain physical and mental health. First your senior loved one needs to choose which of the two models he or she wants to follow. The standard DASH diet allows people to eat up to 2,300 milligrams (mg) of sodium per day, which is generally sufficient for those who simply want to ward off medical problems before they occur. There is also an extremely low-sodium version of the DASH diet, which encourages eating only 1,500 mg of sodium a day. This version is recommended for seniors who have problems with hypertension, stroke, or heart disease. After choosing which model of the DASH diet to use, participants need to become familiar with the eating guidelines. Include many whole grains, vegetables, fruits, and low-fat dairy in your loved one’s meals to follow the DASH diet. Your senior loved one can also eat a lot of lean proteins like fish, poultry, and legumes. Red meat, sweets, and fats are allowed but limited. Vegetables and fruits should be either fresh or frozen to avoid the sodium, which is prominent in the canning process. Consider using vegetables as the main portion of a meal, such as a stir-fry, to make this amount easier to attain. Dairy should be limited to two or three sources a day, and the choices should be the low-fat variety. Low-fat options offer the calcium seniors need without all of the fats they likely don’t need. Examples include a cup of yogurt or one-and-a-half ounces of cheese. Following this healthy eating style is likely to make a person not only be healthier but feel healthier too, meaning it can be a very rewarding lifestyle change. For other methods of enhancing your loved one’s health and lifestyle, reach out to Home Care Assistance. We are a leading provider of Parkinson’s, stroke, dementia, and Alzheimer’s care Altamonte Springs families can trust. From nutritious meal preparation to physical exercise, our highly trained caregivers can encourage healthy lifestyle choices that enhance senior wellbeing and longevity. Call us today at (407) 604-0506 to learn more about our care services and schedule a free consultation for your loved one.